After a successful stint in TV and radio, Sylvia Taylor-Stein made a career change into health care. In the 1980s and 1990s, Sylvia Taylor-Stein had a series of careers, in television, radio, publishing, advertising and real estate. She succeeded in all of them, but they all left her a bit cold. So in 1999 Taylor-Stein saw a career counselor, who put her through a series of interviews and tests, the way a high school counselor would. The counselor suggested some type of social services work. 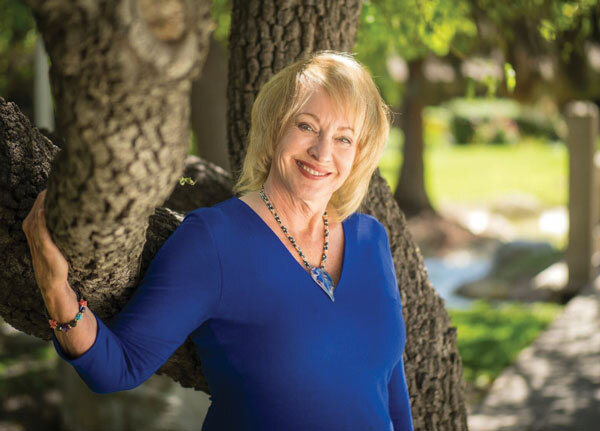 Taylor-Stein was skeptical, but she agreed to go on one interview, for a job as the executive director of the Long Term Care Services of Ventura County Ombudsman Program, a private nonprofit that contracts with the county of Ventura to monitor care in nursing homes and other elder care facilities. She got the job, and 18 years later, she’s still running the program. When she took the job, Taylor-Stein had no experience with services for the elderly, and had only recently learned what the word “ombudsman” meant (the relevant definition from Merriam-Webster: “one that investigates, reports on, and helps settle complaints”). But she did know how to apply for grants, after running a publishing company’s private foundation, and that was the expertise the ombudsman’s office really needed. The first big grant Taylor-Stein secured was $200,000 from the California Endowment. That got the office on secure footing. Today, it has a budget of around $500,000 per year, Taylor-Stein said. About 35 percent of that comes from various government agencies, and the rest is from private fundraising. Long Term Care Services of Ventura County has a paid staff of five people and a volunteer corps of around 60. The volunteers do the work of visiting elder care facilities and responding to complaints from residents and their families. It keeps them busy. There are 19 nursing homes in Ventura County and another 211 assisted living facilities and board and care homes, with a total of around 8,500 residents. Volunteers make unannounced visits to each nursing home on a weekly basis and to each assisted living and board and care home on a monthly basis. That’s on top of their visits to follow up on complaints about care. Most of the complaints are from the residents themselves, Taylor-Stein said, and they run the gamut of elder care: food quality and freshness, hygiene, medicine mix-ups, bedside manner. The ombudsman’s office investigates about 600 complaints per year, Taylor-Stein said. About 70 percent are resolved amicably with the facility. Those that aren’t are referred to state licensing agencies, and, in the case of suspected abuse, to county Adult Protective Services or the district attorney. 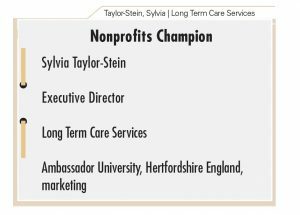 Taylor-Stein said her proudest moment has been a successful campaign led by her agency to reduce the number of people in elder care facilities who are on antipsychotic medications. Those medications are meant for schizophrenia and other serious mental illnesses but are often used to sedate people with dementia or behavioral problems. “We had someone with a broken hip, and they were acting out, they were in tremendous pain, and the facility was just sedating them with a drug until someone finally took them to the doctor,” Taylor-Stein said. As a child, raised on a farm in Virginia, Taylor-Stein was very close to her grandmother. When her grandmother reached her 80s and suffered from Alzheimer’s disease, she was cared for by Taylor-Stein’s aunt. Ten years after her grandmother died, Taylor-Stein was offered the job with Long Term Care Services of Ventura County. It was the memories of her grandmother, and the loving care she received, that moved her to take the job.